Storing clamps has been rather haphazard in my small basement shop. I’d either hang them on the wall, lay them on a shelf, or stick them anywhere I could fi nd space. Then I came up with a way to take advantage of the unused space overhead and built the clamp storage rack you see here. The rack stores all my bar clamps in one place. 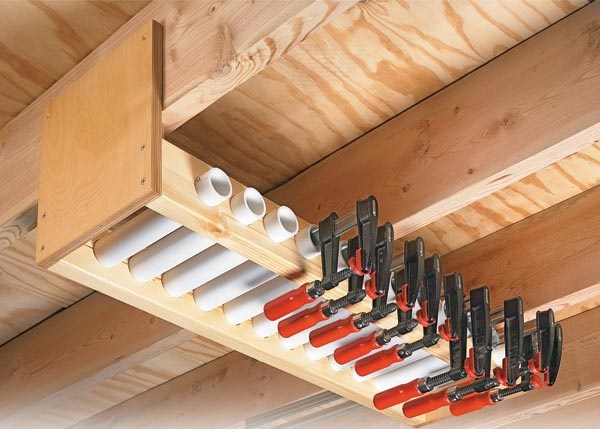 Short lengths of PVC pipe held in the rack serve as compartments to store each clamp individually. By lining the pipes up side by side, I have easy access to the exact size of clamp I need. 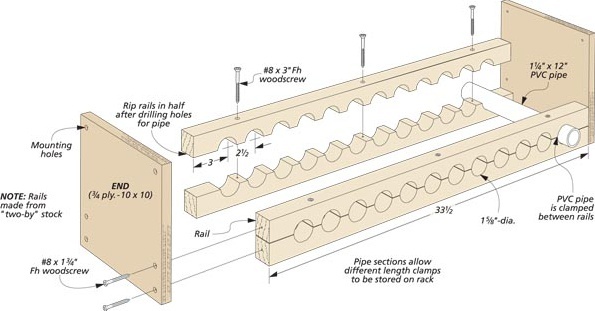 The drawing shows how the storage rack goes together. I started with 2×4 stock and used a hole saw to cut the holes for the pipe. Then, I ripped the rails in half. That way, the rails will grip the pipe tightly when they’re screwed back together. The assembly is attached to a pair of plywood ends. The ends are used to mount the rack to the ceiling joists. After hanging the rack, all that’s left to do is slide your bar clamps into the pipe.